Nothing can be more frustrating than a continuous faucet leak. The sound is annoying the the wasted water costs money. The problem usually results from a bad stem and seat in either the cold or hot faucet outlets. The Danco 3G-3H hot water stem is used on compression-type faucets. Nothing can be more frustrating than a continuous faucet leak. The sound is annoying the the wasted water costs money. The problem usually results from a bad stem and seat in either the cold or hot faucet outlets. If you have a Danco 3G-3H hot water stem, a common model used for sink faucets, remove the faulty stem beforehand and have it matched up with the proper stem and seat replacement package at the local hardware store. You can then use a few basic tools and steps to perform the replacement in a relatively short time. Test the dripping water with your hand to make sure that it is the hot water side that is leaking. Lay a rag over the sink drain to keep parts from falling down it. Locate the hot and cold shutoff valves under the sink and turn the knobs clockwise by hand until they close. If the knobs remain stiff, use a pair of pliers to gently turn them until the knob begins to move, then finish turning by hand. 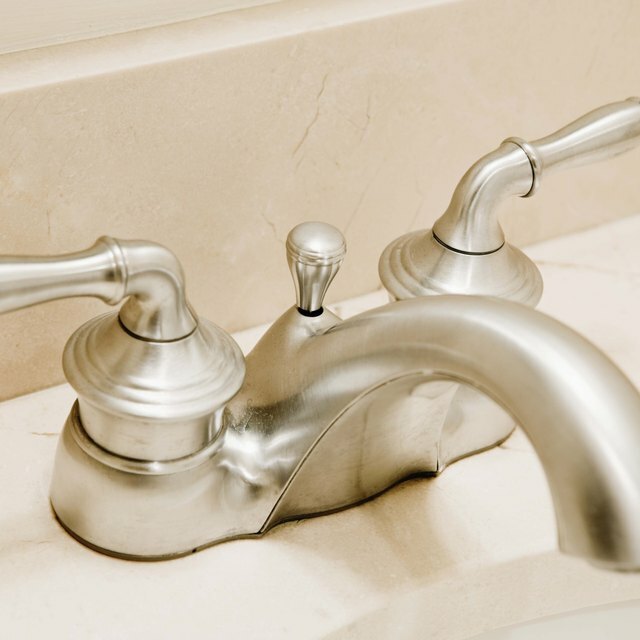 Pry the decorative cap off the faucet top with a small thin, flat-head screwdriver. Remove the cap that has the "H" letter on it. Depending upon the handle screw configuration, use a flat-head or Phillips-head screwdriver to remove the handle screw. Gently pry up on the handle from all angles and pull it up and off the splines of the stem. Use a crescent wrench to turn the hot water stem nut counterclockwise until it comes completely off the stem shaft. Wiggle the stem with your fingers and pull it out of the faucet. If the washer on the bottom of the stem is deformed, it indicates the source of the leak. However, remove the old seat from the faucet base with an Allen wrench or a seat removal tool. Wipe out the inside of the seat housing with a rag. Replace the seat with the new one included in the repair package, using an Allen wrench or seat removal tool. Place the new hot water stem shaft into the valve seat, and start the stem nut in by hand, turning it clockwise. Finish tightening the stem nut with the crescent wrench, but only to a moderate firmness -- do not over-tighten it. Place the handle back over the stem shaft and tap it down until it seats firmly. Replace the handle screw and tighten it with a screwdriver. Turn the hot and cold water supply knobs counterclockwise until they are fully open. Turn the hot water faucet knob to the "On" position and check for leaks. To replace the 3G-3H hot stem at the hardware store, fit the old stem in the length guide and make note of the number, which will range from "Number 1" on upward. Then fit the stem into the test couplers on the display rack, which will give you the stem width. With those two numbers you can find the correct replacement package on the display board. It is always a good idea to replace the seat along with the stem, if the stem has corroded the seat or deformed the seat face. [DELETED]What is the Best Time to Do a Home Pregnancy Test?